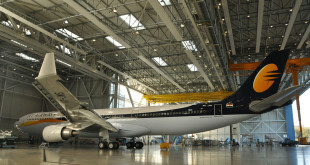 Jet Airways will re-commence operating flights to New York JFK airport, but from Abu Dhabi, not from India. The airline along with its partner Abu Dhabi based Etihad Airways, which holds a 24 per cent stake in the Indian carrier, announced that Etihad will commence its second daily on the route from March 1, using two leased Jet Airways Boeing 777-300ER. From May 1, the flight will be operated by Jet Airways. From March 1, Etihad Airways flight EY103 will depart Abu Dhabi at 01:45 and arrive at New York’s John F Kennedy Airport at 07:45 the same day. EY102, will leave New York at 11:35 and arrive in Abu Dhabi at 09:20 the following day. These two flights will complement the existing Etihad Airways Boeing 777-300ER service, EY101, which departs Abu Dhabi at 10:30, arriving in New York JFK at 16:30 the same day, and EY100, which leaves New York JFK at 21:.40 and arrives in Abu Dhabi the next day at 19:25. Jet Airways will continue its existing leverage of Abu Dhabi as a scissor hub for the new flight as well, bringing in narrow body Boeing 737 operated flights from New Delhi, Mumbai, Chennai, and Kochi to connect to the new flight as per the schedules below. The airline already flies onward from Abu Dhabi to Kuwait City and to Dammam, Saudi Arabia, using fifth freedom rights granted to it under the India Abu Dhabi bilateral air services agreement. Unfortunately, Bangalore is not connected to the new flight. Anyone wishing to travel to New York JFK on Jet will have to connect via Mumbai or New Delhi, or fly Etihad for the late afternoon arrival. One can only hope Jet Airways and Etihad see the missing potential of providing Bangaloreans an early morning arrival in New York, and commence a Bangalore Abu Dhabi flight. The Jetihad combine will need to move fast; competitor Emirates is upgrading Bangalore to Boeing 777-300ERs which feature the newer cabin products, due to the runway closure in Dubai that is expected in the May time frame. 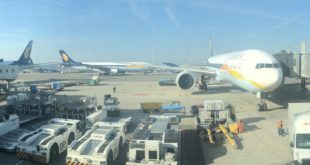 The initial joint announcement was vague and did not provide details if Jet Airways will operate the flight from India to New York via Abu Dhabi, or just on the Abu Dhabi New York sector. A search of the Jet Airway’s website did not even show JFK as a destination, while Etihad’s site returned with only EY103/102 flight numbers, leading us to believe that this flight would be a “wet-lease” arrangement. Jet Airways did provide us some clarifications, but we remain perplexed on the modus operandi. From 1st May will Jet Airways operate this flight under a 9W flight code or will it be a wet-lease arrangement between 9W and EY and the flight will continue to be operated under an EY flight code? Once the flight is taken over by 9W on May 1, what will be the routing of the B77W aircraft? Will the flight operate from india to JFK via Abu Dhabi? or will the flight originate and terminate in Abu Dhabi? It remains unclear whether the flight will have a Jet Airways flight number. New York JFK is not available as a destination on the Jet Airways website. We queried on when New York would be listed as a destination or when this new flight would be listed, the airline spokesperson replied “In due course”. What are your thoughts on this announcement? Share them via a comment. Next High resolution aerial view of Mumbai airport new terminal T2. Can you spot the inconsistencies?